Wireless video door phone. 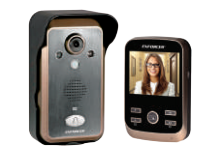 Talk with visitors and unlock doors or gates via LCD monitor. Wide 3-3/8” monitor screen. Connect up to two additional monitors (sold separately). 9~16 VAC/ VDC operation – connects to most doorbell circuits. Wide 170º adjustabe camera viewing angle.